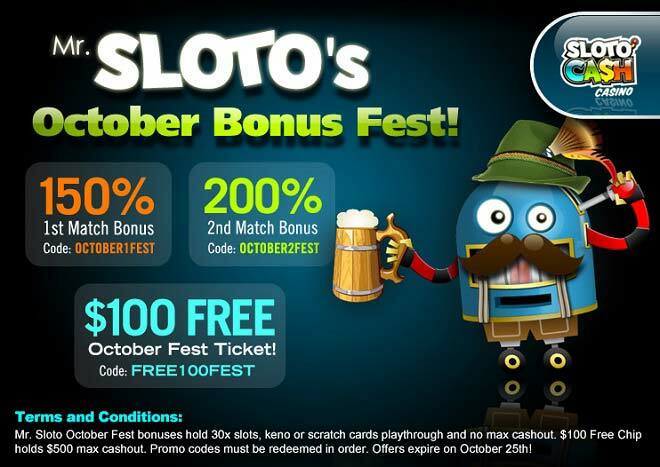 Mr. Sloto's October Bonus Fest is Here! Winter is just around the corner for many, which means October is here! And this is the perfect time to watch the leaves fall, the seasons change, and heat up with three Mr. Sloto’s huge, fat bonuses! Embark on a new and exciting transition this October and get cozy with a gigantic fest of bonuses! The hunt for winning experiences is on this fall as you claim a 150% 1st Match Bonus when you deposit next. Continue your season of change when you make a second deposit that grants you a 200% 2nd Match Bonus to your Sloto action. Welcome the month of change with even more winning times and play with a $100 Free October Fest Ticket for having claimed both Mr. Sloto's October deposit bonuses! $100 Free October Fest Ticket!